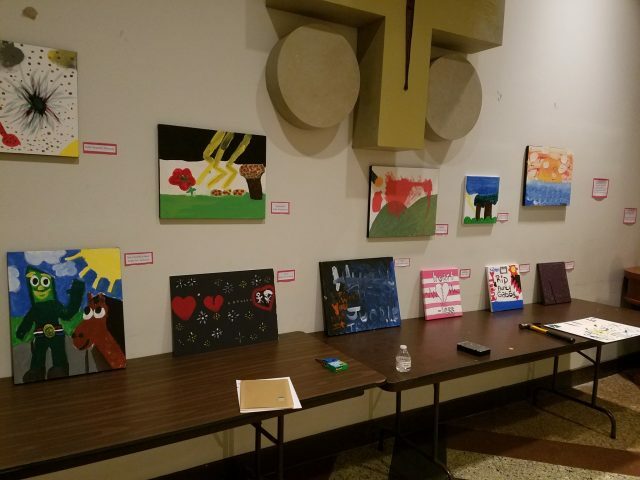 On Thursday, October 12, HeartShare St. Vincent’s Services hosted an art exhibition at 66 Boerum Place featuring the culminating artwork of its pilot creative arts therapy program. The youth in care participating in creative arts therapy debuted their work in an exhibition at 66 Boerum Place. This change also comes from a partnership with ALIA, which provides educational training to help youth heal and achieve permanency before aging out of care. Traditionally, youth in foster care face punitive measures for their behavior, which is a normal human reaction to being separated from family and supportive adults over and over again. In this collaborative effort between HeartShare St. Vincent’s Services’ clinical and residential programs, the agency brought Joey Modica, one of its Licensed Creative Art Therapists to its two Queens group homes for sessions. “Our youth were so much more receptive to group sessions in a more informal setting,” said Xaviera Romero. The young people painted and created collages. Some even planted a garden and built the fence for it. Through this trauma informed lens, HeartShare St. Vincent’s Services continues to innovate in its mental health offerings, such as rolling out a 6-week pilot movement therapy program, which focuses on mindfulness and meditation. “It makes so much more sense to bring these kinds of conversations to the home, where mental health best practices can be applied to their everyday life,” she said. “It also creates a common language for the clinical and residential staff, who can then work together to help the kids access what they need to feel better and heal.” Young people interested in further care can schedule an appointment at the clinic at 66 Boerum Place.